Nestled along the banks of the Concord, Sudbury and Assabet Rivers, the historic town of Concord offers residents a scenic, natural backdrop that’s rarely seen in today’s fast-paced, high-tech society. With sparkling ponds, dozens of historic sites and a literary and political past that few American towns can boast, it remains one of the most sought-after places to live in all of Massachusetts. And though it might be small in size and population, this charming town is anything but boring. Just a mere 20 miles from Boston, big-city amenities are well within reach from Concord. Hop in the car, hit the road, and adventure awaits in minutes. Not all fun is as far as car ride away, though. Within the town’s boundaries, you’ll find everything from museums and wildlife refuges to book stores, art houses, libraries, and recreation centers. The picture perfect town center also offers several opportunities for an outing. With everything from high-end vintage thrift stores to comforting diners, this town center is one that is constantly buzzing with activity. Aside from everyday attractions in Concord, there are community events, like Breakfast with Santa, a Thanksgiving food drive and more. It’s a veritable hub of activity for the whole family. But Concord wasn’t always this booming. First settled by British colonists in 1635, the town was purchased from local Algonquian tribe members. In 1775, when the Battle of Lexington and Concord took place, it became a major part of the Revolutionary War. The legendary Paul Revere warned townspeople of the oncoming British attack, allowing them to prepare and take up arms. The town has since been immortalized in various books, songs and speeches, making it one of the most memorable names in the state. Though Concord certainly has a rich history, its bountiful education opportunities give it a bright future, too. Students in the area attend Concord-Carlisle Regional High School, a school often regarded as one of the best in all of Massachusetts. In fact, according to Boston Magazine, it was the No. 1 school for cost efficiency and No. 3 in academic performance. It also boasts a variety of extracurricular and athletic opportunities, with organizations for fencing, swimming, skiing, football, soccer, golf, band, choir and theater. If a town this rich in history and amenities seems like it is in demand, it is. With higher real estate costs than towns further out from Boston, Concord's housing stock is prime, and prices have climbed steadily over the past few years. While there is a possibility of owning a starter home in Concord for around half a million dollars or more, those looking for a roomier estate, sprawling properties with three, four and five bedrooms, as well as expansive lots, can expect to look for a home that will run upwards of $800k. The average home price in the area is about $482,000, which also includes condos, which go for a minimum of $250k for around 1,000 square feet. 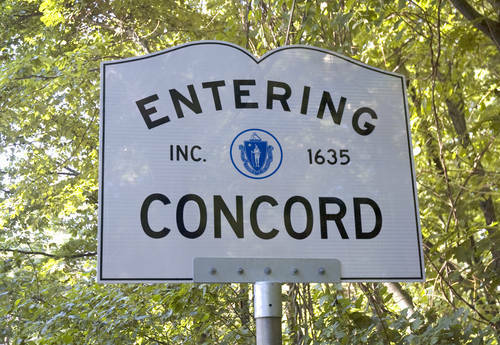 With a seasoned history and storied past, Concord offers the perfect backdrop for growing, living and thriving.